Situated between Milos and Sikinos, Folegandros, Greece is one of the most naturally beautiful islands of Cyclades in the Aegean Sea, with breathtaking scenery of mountain areas, rocky ground, green fields and deep blue, crystal clear waters, making it one of the most popular travel destinations in Greece for tourists worldwide. I visited the Folegandros, Greece for the first time several years ago. I remember I fell in love with the island the moment I arrived at the port of Karavostasis. The Agali beach is named after the Greek word ‘’Angalia’ which means ‘’hug’’ and it took that name because of the huge rocks that seem to be ‘’hugging’’ the beach. This is the most crowded beach and ideal for swimmers. Ideally located to the northern part of the island, the sandy, crystal water beach of Agios Georgios is extremely popular. Only thing to be aware of is that this beach is subjected to strong winds, so it is wise to check the weather report before visiting. Situated on the top of a cliff, on the ruins of a temple, there is Church of Koimisis tis Theotokou, dedicated to Panagia Theotokos (Virgin Mary). According to an old legend, the church was built by an islander who was kidnapped by pirates, and was miraculously saved once he found the icon of Panagia Theotokos in the Aegean Sea. Built during the 13th century to protect the inhabitants from pirates, the Venetian Castle offers a spectacular, breathtaking view of the Aegean Sea, as well as the chance for visitors to see the church of Panagia Pentanassa. I visited in late afternoon, while the sun was going down, and I had the chance to enjoy an even better view because I climbed on the top of the church, so I have associated that experience with one of the most romantic moments in my life. For lovers of nature like me, the Ecology and Folk Museum in the capital of Folegandros, Chora, is a must-see. The museum displays an impressive variety of farming tools, ideal for everyday use, housed in a farm house. 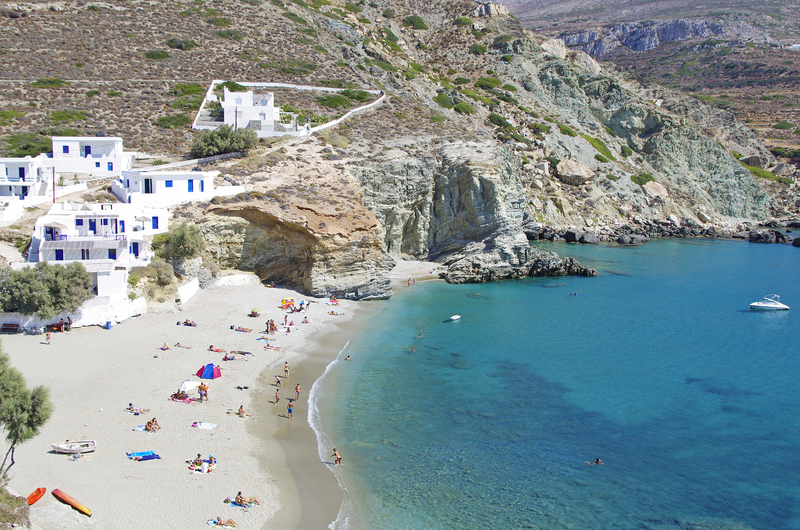 If you are looking for a peaceful and serene place to spend your summer vacation, the island of Folegandros is a perfect choice.